Having grown up outside of Fort Lauderdale, Florida, I like to hold myself out as an expert on all things South Florida. When my husband suggested we visit Sunny Isles Beach, I immediately responded, “That’s not Miami” in my smug expert way. 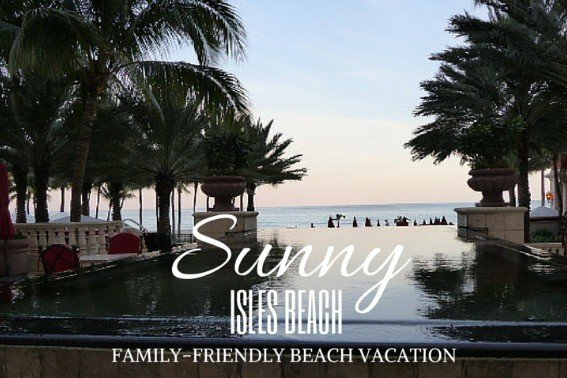 Truth be told, I had no idea where Sunny Isles Beach was but when he uttered the words Trump International Beach Resort, I resigned my know-it-all title and packed my bags. The reality is that Sunny Isles Beach didn’t really exist when I was growing up in Fort Lauderdale. Instead, the slim piece of land that lies directly between the Atlantic Ocean and the Intercostal Waterway was known as “Motel Row.” I remember driving past hotels like the Sahara built in 1956 whose large camels still stand proudly outside much worse for the wear. 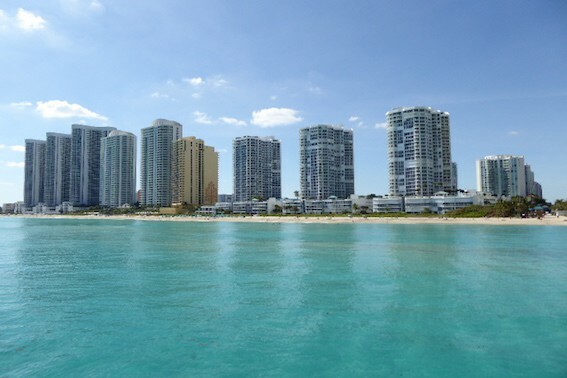 In 1997, the area became incorporated as Sunny Isles Beach and there was no looking back. Here is why it’s an amazing spot for your next family vacation. Where is Sunny Isles Beach? Located between Fort Lauderdale and Miami, the small stretch of beach is only a 30-minute drive from Miami International Airport and 25-minute drive from Fort Lauderdale International Airport. It’s also located directly between the cruise ship ports in Miami and Fort Lauderdale, about a 30-minute drive from each, making it the perfect pre- or post-cruise stop for a family beach vacation. We stayed at the Trump International Beach Resort and it was perfect. The hotel was clean, the rooms were huge, and there was tons to do from the gorgeous grotto pool to the lovely spa. The best part was the kids’ camp that runs daily, and also happened to be included in the cost of the room. My kids loved exploring the property, heading to the beach and pool, and learning about the environment with the dedicated camp counselors. Although the Trump boasts impressive beach views, the highlight for us was the size of the outdoor space. With two large pools, two tennis courts, several hot tubs, and a pristine beach, there is tons to do onsite and plenty of space for the guests of the resort. Next to the Trump International Beach Resort is the uber luxurious Aqualina Resort and Spa. Here, Bentleys line the driveway while you and your children are pampered by the pool. The views, hotel, and restaurants are on point but expect a high price point. At a more economical price point, families can choose from a number of great beachfront hotels including the Doubletree by Hilton Ocean Point Resort and Spa, Marco Polo Beach Resort Ramada Plaza, and the Newport Beachside Hotel & Resort. 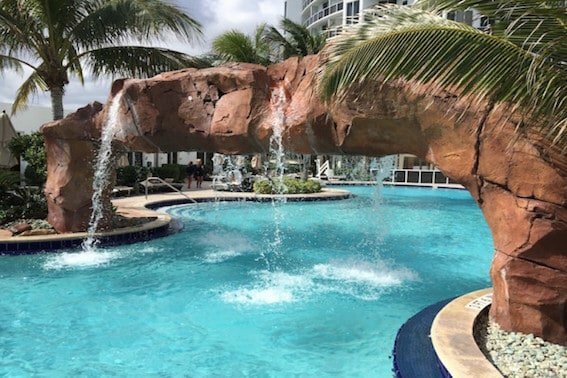 Whether planning a trip as part of a cruise or to Sunny Isles alone, you will want to plan for a few days to enjoy the gorgeous beach and array of huge family friendly parks. We love exploring parks on our vacations. 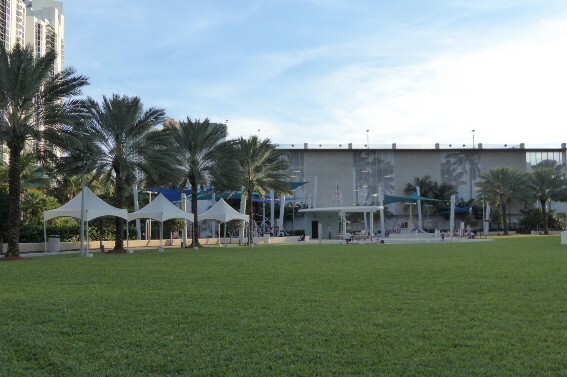 I couldn’t believe the amount of public green space in Sunny Isles Beach. In total there are 11 parks in Sunny Isles Beach all offering different amenities and views. For families, Heritage Park is not to be missed with two great playgrounds, a splash pad, and four-acres of green space. I loved that the playgrounds were covered and found them to be the perfect place to escape when we had had a little too much sun. After spending the day at the parks and the beach, make sure to head to the Newport Fishing Pier to watch local fisherman at work. When we visited, the water was so clear we could see spotted stingrays playing below us while we ate ice cream and checked out the pelicans. The pier is also a great spot for lunch or dinner, with plenty of options for fresh fish, sushi, and salads at the Newport Pier Beach Bar. 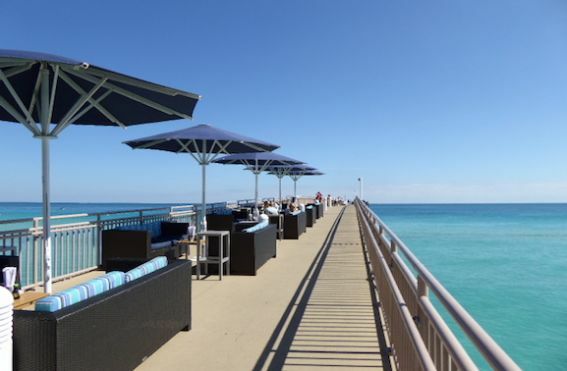 Head outside for lunch on the actual pier, eat on comfy couches, and enjoy a great view of Sunny Isles Beach. No vacation is complete without great dining, and we found a number of great restaurants in Sunny Isles Beach. For a gorgeous outdoor venue and a more upscale experience, book a table outdoors at Il Mulino New York or AQ both located in the Aqualina Resort. The food was delicious and the staff incredibly welcoming to kids. If brunch is more your thing, make sure to check out Family Fresh Cafe, a cute restaurant with playroom, outdoor toys, and killer food. My kids raved about their pancakes while I devoured the most delicious Croque Madame I’ve had this side of the Atlantic. Disclosure: We were invited guests of The Trump Miami and AQ Restaurant at Aqualina. All opinions are my own.